Description: There is much to be learned about alpacas, from vaccines to genetics. This informal program is ideal for those who wish to learn the basics of alpaca care and ownership. Learn how to select an alpaca for purchase with "hands-on" instruction, basic health care, breeding, shearing, fiber sorting, grading and much more. One 2 hour session, from 9:30 am to 11:30. Other times available by appointment! Pre-Registration Required: Contact the farm @ 1-508-693-5554, or by email info@islandalpaca.com, payment can be made online or by check. Class Fee: $50 per person, $75 per couple. 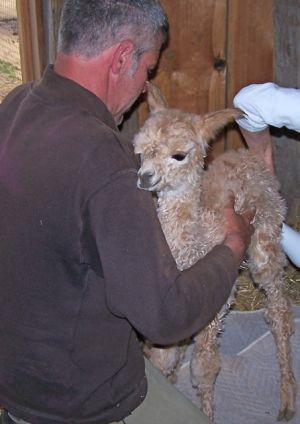 Full credit of class fee applied towards a purchase of any Island Alpaca Co. alpaca, or breeding. Please note @ check-out, the names of participants and your requested date and secondary date. Our class is very informal, and will adapt to your needs as a breeder, or soon to be breeder. Throughout the class we will take any questions and answers, and happy to discuss any topic at greater length. Pasture Management, Barn Set-up, Fencing. "Barbara, Jeff and I had an amazing time on your farm. I thank you so much for hosting us for my best birthday ever. My highest compliments go out to your staff: Ivy and Ashleigh.